Swimming has been a part of my life as far back as I can remember. Fortunately as a swim Coach, I possess very distinct memories of the fears I had and what worked for me as a young child learning how to swim. My history of swimming dates back to around age 3 and progressed through the years as I took my love of swimming to higher levels from early childhood lessons, to swim team, to triathlons, to swimming miles, effortlessly, in the chilly waters of the San Francisco Bay. In addition, through years of experience working with children and discovering what works and what does not work, my goal is to help them understand the importance of their interaction with the water. Total Immersion has taught me the very basic, but most important, principles of swimming that, unfortunately, I missed at an early age. Learning to swim is similar to the skill of ballet and gymnastics, both of which require fine tune focus and practice in order to excel. TI has emphasized that swimming is not just a physical process, it is also a neural process. Swimming is a skill acquired only through mindful practice and repetition. I firmly believe that introducing the basic fundamentals of TI to a child, in their most formative years, will not only help them dramatically in their success with swimming, but most importantly, increase their perception of learning. It is important to realize that in order to be a great influence and educator for your child, it is crucial for you to understand the principles of Total Immersion. The fundamentals and approach of TI can help you teach your child the vital components of swimming and how they will perceive this new, exciting environment – and most importantly, have a new found enjoyment and overall comfort in the water, which benefits the both of you. Consequently, this is another chance for you to really bond with your child and help them learn something so important in their life. After all, you are the greatest influence in your child’s life at this early stage of development. As you teach your child, you will realize this is also important feedback for yourself because the TI basics you teach your child are taught to all ages. Pay close attention to what happens when tension plays a role in the water and what direction energy flows. You are the initiator and it is the child’s role to absorb the visual feedback and eventually imitate what they are observing. You will begin to understand the importance of teaching your child as early as possible, having an overview of certain developmental concepts that will aid in their learning. Once you are able to have your child experience an environment that we were not genetically designed to survive in, you will create a life-long adaptation through neural and cognitive development and being able to adapt correctly to a new stimulus with confidence and comfort. Furthermore, through a process of discovery acquired from years of teaching children and adults, I have collected as a coach a progressive model that is continuing to evolve and improve. It is such a thrilling experience to witness dramatic changes in a child’s skill set and witness how much they love the water. 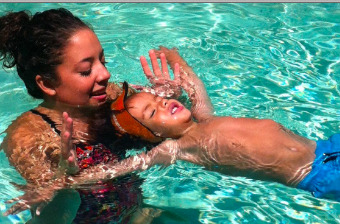 1) COMFORT: Introducing them to breathing and floating. 2) SAFETY: I can’t express this enough as far as teaching your child the importance of safety skills in the water so that they understand that no matter how fun and exciting the water may be, he or she must know that safety is #1 priority. This is accomplished by teaching them specific safety drills so that they are confident and happy. 3) FUN! : This shouldn’t be an overwhelming experience for a child but should be taken seriously to make sure they have fun and enjoy their time in the water. It is absolutely vital to make sure that your child is not pushed too far. This will limit their level of learning whether in their formative years or when they become adults. If the issue is not addressed quickly it will unfortunately imprint a subconscious fear that is difficult to get rid of. Since I have been teaching adults in the TI method, I have come across dozens of people with these similar experiences which only leads me to believe that this is the reason why they have a slower rate in achieving certain milestones in the water. So have fun and enjoy this time with your child by making every minute purposeful. Your child will express their overwhelming gratitude through their swimming and throughout their whole life. Did you ever get around to writing a book on TI for kids? I have a water phobic ten year old, who has learned alot of bad habits in lessons….